Please refer to our stock # 40J39-103 when inquiring. 'After the Storm, Flint Hill Rd. ', Braintree, Vermont by Carolyn Egeli. Oil on canvas. Size: 30 inches x 40 inches. Circa 2018. Signed in lower right. Offered in a gilt wood frame. Carolyn Egeli is a contemporary landscape and portrait painter. Originally from Maryland's Chesapeake Bay region, Carolyn now lives and paints on an old farm in Braintree, Vermont. In her large-scale paintings, Carolyn portrays the spirit of life in rural Vermont. 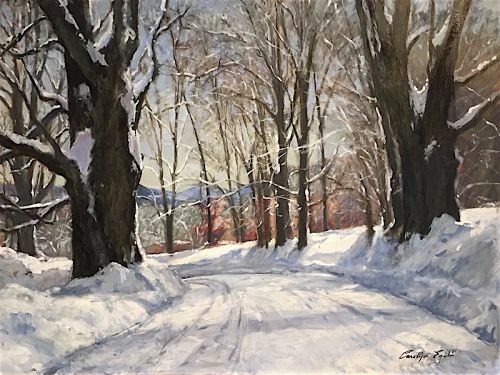 This dramatic painting captures a snow covered country road after a winter storm in central Vermont.